Lettuce is among the easiest of vegetables to grow. The many kinds are categorized by their forms-- looseleaf, butterhead, crisphead and Romaine. All are cool weather crops. They grow best in the lower temperatures typical of spring and fall in most areas of the country. Looseleaf types have less crunch than crisphead types, but they tend to have more flavor. Because looseleaf and butterhead types of lettuce grow more quickly than crisphead or Romaine types, they are most commonly recommended for backyard vegetable plots. These two types represent the traditional garden lettuces. However, crisphead and romaine types are worth considering as well. Loose leaf lettuces do not form a head, but grow in loose rosettes of broad curly leaves radiating out from their crowns at soil level. A single loose leaf plant typically grows from 4 to 8 inches tall and spreads from 6 to 12 inches across at maturity. 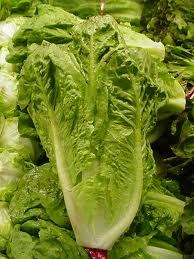 This type is the earliest producing of all the lettuces. Loose leaf varieties of lettuce come in many shapes, one even resembling oak leaves. Foliage texture ranges from smooth to crinkled and curly, the latter type being slightly crisper. Leaves may be many shades of green, several tinged with red or bronze as well. Butterhead lettuce, also called ‘Bibb,’ Boston, or loosehead lettuce, forms into loose, fragile heads about the size of salad plates. The rounded clusters of tender leaves sit about 4 inches tall and have a diameter from 6 to 10 inches. They mature in 60 to 75 days. The pale yellow inner leaves are wrapped with layers of increasingly darker green outer leaves. Some varieties have coppery colored outer leaves. Crisphead lettuce, also popularly known as Iceberg lettuce (after one of the earliest and most famous varieties) is the lettuce most widely available in supermarkets. It has a tight, compact head with crisp, light green leaves. Many gardeners find crisphead types hard to grow because they require a longer growing season. Some of the most advertised varieties are not heat-resistant and tend to go to seed, or “bolt”, as soon as temperatures go up. Romaine, also called Cos, is less commonly grown by gardeners, but it is a very nutritious lettuce that deserves wider attention. It is relatively easy to grow, forming upright heads of long, coarse, dark green leaves with thick, stiff midribs. Six or 8 looseleaf lettuce plants will keep a small family in salads for several weeks if you regularly pick the outer, mature leaves. Then, as you gradually cut back each plant, you stimulate it to produce new foliage for yet another round of salads. A single butterhead lettuce plant provides enough lettuce for a salad for 2 people. Since you pick this lettuce by the entire plant, 6 or 8 of these plants will supply a family’s salad greens for 3 or 4 weeks. A small family that enjoys salads can grow sufficient lettuce in an 8 to 10 foot square area. The trick to a continual supply is to plant a few new seedlings every three or four weeks to replace harvested butterhead plants.